The Stage, announces a weekend festival focusing on the era when soul music prevailed. In honor of all things soulful, The Stage will transform its multi-faceted space into a celebration of soul music from Friday, July 20 through Saturday July 21, 2012. 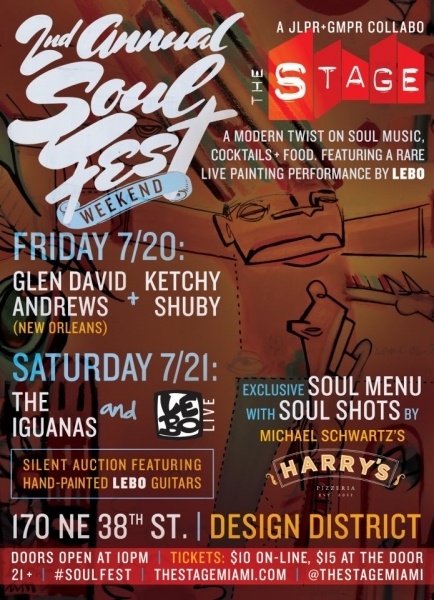 The second annual festival includes live musical performances by New Orleans’ favorites Glen David Andrews, The Iguanas, Miami’s own Ketchy Shuby, LEBO Live!, Soul Shots by mixologist Ryan Goodspeed, and an exclusive menu in collaboration with Design District neighbor Michael Schwartz’s Harry’s Pizzeria. On Friday, local Miami standouts, Ketchy Shuby, will perform their “Downtown Soul” along with NOLA native and favorite, Glen David Andrews. Saturday promises to be just as soulful with The Iguanas of New Orleans whose soulful, upbeat, rock music has been notably featured on the HBO hit series, Tremé. The line-up represents a broad range of styles, sounds and influences, including a combination of New Orleans funk and Miami flavor. Glen David Andrews is considered “one of the giant talents of New Orleans“ by New Orleans Jazz and Heritage Festival (JazzFest) Producer, Quint Davis. A frequent JazzFest headliner, USA Today calls him a “showstopper” who “rocks the blues, takes it to church and carries it into the mosh pit.” The gospel/R&B singer and trombonist plays an electrifying set and he’s not afraid to crowd surf amidst his funk-thirsty fans. His performances include everything from Down in the Tremé to a “Cajunized” version of The Clash’s Should I Stay or Should I Go. Miami-based artist, LEBO, is putting five hand-painted guitars up for grabs in a special silent auction during the event and an additional guitar will be raffled to a lucky patron at the end of the night. Autographed, limited-editionLEBO prints will be given to the first 150 people to arrive on Saturday night for LEBO LIVE!, a rare live painting performance. Later crowds have no need to fear, a merchandise stand featuring LEBO’s original, new apparel line will offer more of his creative suite on Saturday night only. Harry’s Pizzeria, a casual neighborhood joint by award-winning chef Michael Schwartz, will be serving a soulful menu in the The Stage’s courtyard during the festivities from 10 p.m. to 1 a.m. on both nights.